Hearing instrument technology has advanced significantly since they were first introduced. Now, with today’s technology, we offer hearing loop systems that will allow you the freedom to clearly hear conversations, attend church, watch performances at your favorite venues and more, without the worry of not being able to enjoy the experience. We offer residential and commercial induction hearing loops to help those with trouble hearing. Our systems work seamlessly with your telecoil hearing loop, and our professional installation specialists will be able to walk you through how they work. Learn more about these systems and hearing instruments below. 1. Why Should We Call Them Hearing Instruments and Not Hearing Aids? 2. What Do Hearing Instruments Do? 3. Why Do People Fail in Their Use of Hearing Instruments? Why Should We Call Them Hearing Instruments and Not Hearing Aids? With the advances in technology in the past 5-10 years, many hearing aids have become much more sophisticated than the hearing aids of the past. 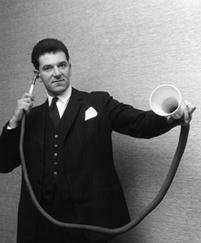 The first hearing aids were enormous, horn-shaped trumpets with a large, open piece at one end that collected sound. The trumpet gradually tapered into a thin tube that funneled the sound into the ear. Many people remember their grandparents or parents wearing hearing aids which weren’t much more than an amplifier. Unfortunately they not only increased the volume of speech and conversation, but they also made all the other noises and sounds in the room louder, which made it impossible to understand what the conversation you were involved in. Due to that as well as the large size of the older style hearing aid, and poor reliable and performance, a bad stigma has encumbered the reputation of hearing aids. Technological developments have improved all of those issues as well as many others. Eye glasses have been widely accepted for well over a hundred years by those who need them to improve how they see, but hearing aids are still looked upon negatively by those who need them to improve how they hear. Hearing aids have now advanced to the point that calling them hearing aids would do them a great injustice – hearing aids are what previous generations wore. These are truly high tech communication instruments hence the term HEARING INSTRUMENTS. That is not to say that all instruments are created equal. There are substantial differences for manufacturer to manufacturer and model to model. A hearing professional will be able to recommend the instruments that will be most appropriate and effective. What Do Hearing Instruments Do? Hearing instruments do more than help a person hear, they allow the brain to remain active in the ability to understand what is being heard. Once hearing instruments are purchased they must be worn. Frequently people with a high pitch hearing loss, mild hearing loss, or those who live alone say “I only need hearing aids when I go to ………..” Consequently the hearing instruments are worn for only a few hours a week. Because the hearing loss has been present for many years and the brain has forgotten how to use some common sounds, wearing the hearing instruments as much as possible is very important. The brain will take about a year of consistent hearing instrument use to reach maximum ability to use and interpret sound. The process is easier if the hearing loss is mild and has not been present for more than ten or fifteen years but is much harder if the hearing loss is more severe or has been present for a longer period of time. Initial use of amplification may require progressive re-programming of the hearing aids to re-introduce the brain to sounds at a slower pace. This is completed in stages over the course of a year. The reintroduction of the brain to long missed sounds takes time and effort on the part of the wearer. Patience, perseverance, and realistic expectations will lead to a successful hearing instrument experience. Why Do People Fail in Their Use of Hearing Instruments? Once the first symptoms are present or a loss is diagnosed by a hearing professional, it is imperative that the use of hearing instruments begins immediately to realize the greatest benefit. As previously discussed, typically the recognition and then acceptance of hearing loss takes years and then additional years are required for the person to actually accept the need for hearing instruments. As each day, month, and year passes by, the benefit a person can realize from the use of instruments diminishes as the loss becomes more severe and the brain is deprived of more sounds. So by the time a person goes through those stages and finally decides he or she should wear hearing instruments, they don’t get as much benefit as they would have had they accepted it earlier. Remember, they are called hearing aids or instruments, not hearing replacement systems; Hearing instruments can only work with what hearing remains. Naturally the hearing instrument and/or the hearing professional are very frequently blamed rather than the person in the mirror. Often times in our society, we are judged or we perceive that we are judged, by our outer appearance rather than by the person we are inside. For that reason, many people select the improper size hearing instrument because they live in fear of what others will think. Rather than choosing the instrument the hearing professional suggested as most appropriate to address the loss, needs, and lifestyle of the hard of hearing, they chose the one that will be least likely to be seen. THIS IS ONE OF THE BIGGEST MISTAKES A PERSON CAN MAKE. Each instrument is designed to meet a certain classification, severity, or type of loss and by not following that suggestion can lead to dissatisfaction with the instrument. As an example, if a person has a profound loss and they choose an instrument intended for a minor loss, then there will be sounds that the instrument cannot improve upon. Meaning parts of speech will still not be heard properly or at all. Hearing Instruments are not one size fits all! That being said, as technology improves, instruments are becoming smaller and stronger at the same time. Losses that a few years ago required larger instruments now allow for the use of smaller ones. Consult your hearing professional for more information. First of all, let’s not confuse the word CHEAP with AFFORDABILITY. We all recognize that everyone has different levels of income, different circumstances in life, and other situations that dictate and determine our budgets. The general rule of thumb is that a person should always acquire the best instrument that they can afford. By doing so, they ensure themselves that they have done everything they can to preserve the remaining hearing they have. People become unhappy with their instruments many times because the level of technology they choose is not appropriate to meet their needs. For the hearing professional to be able to guide them to making the appropriate decision he or she has to know a few things first; these things affect not only the selection of appropriate technology but also the selection of the appropriate size. An example of a few of those things are how severe is the loss, how long have they had it, do they have any vision or dexterity issues, and what is their lifestyle like (how active and what activities). If the professional isn’t made aware of those things, the improper recommendation may be made. Getting back to the original point of cheaper is not better; the level of technology generally determines the price of the instrument. The more the need, the more active, the more diverse situations they find themselves in, and/or the more the desire to hear better, the more technology is needed. As an example, some of the lower levels of technology instruments are not very proficient at reducing background noise. Well, if the hard of hearing person is bed ridden then it is not a problem, but what if the person still works or is very active in a retirement community. Background noise will become a problem. This is not a matter of considering which store to buy a TV at or which dealership is going to give the lowest price on a car, this is their hearing, not a luxury or leisure item. Good hearing instruments are not cheap, but neither is quality of life. Once the hearing is gone, it is gone. The final common reason people don’t succeed with their wearing of hearing instruments is because they decide they know more than the hearing professional. Hearing instruments are intended to be worn all the time, not only at night to watch TV or when you go to church. ALL THE TIME. The only time they should not be worn are the obvious times, i.e. swimming, showering, sleeping, and etc. The more the instruments are worn the more the brain is stimulated with speech and sounds the better the results will be. If a person chooses to wear them part-time, the satisfaction level will be very low and probably as much harm is being done as good. 1. One ear has a loss and the other is normal. No need to put an instrument on a normal ear; it already hears well. 2. One ear has a loss and the other is dead/deaf. No need to put an instrument on an ear that is dead; it won’t help. 6. Listening balance – they won’t be turning their “good” ear to hear. 7. Higher success and satisfaction – studies indicate people who wear two hearing aids are much more satisfied with their hearing aids. We were born with two ears because we need two ears, the same is true for our eyes, arms, legs and kidneys. People who have lost hearing in one ear will tell you it is VERY difficult to get by using only one ear. The quality and clarity of sound perceived with one ear is simply not as good as two ears. The brain depends on BOTH ears working together to tell the listener where the sound is coming from, how far away the sound is, and to help sort out speech from noise. Additionally, each ear is ”hard wired” differently to the brain. Information from the left ear crosses to the right side of brain and information from the right ear crosses over to the left side of the brain. Most people think of ”hearing” as something that happens in the ears, but in reality, the BRAIN interprets the signals from the ears into sound. So, in many respects, we really don’t fit the ears with hearing instruments, we ultimately fit the brain.